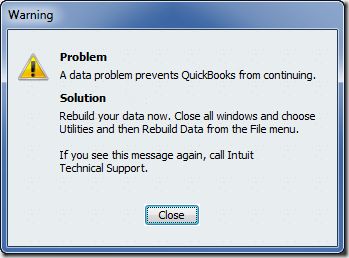 Oops – just as Intuit is starting to release 2011 R4 to automatic update, it looks like there may be a problem. I can see the problem in my installation, but I’m not sure what the full impact is at this time. I’m recommending that you not update to R4 at this time. 01/06/2011 Update: The R5 release is out, which includes a fix for these problems. I talked about the QuickBooks 2011 R4 release a few weeks ago. There are a LOT of changes there, and I was recommending that people install this revision. My feeling was – if you are already using QuickBooks 2011, better to be on R4 than on R1 or R3. But – based on a problem we are seeing, I’m thinking that you shouldn’t upgrade to R4 quite yet. There is a problem, and I can’t tell how important this is. 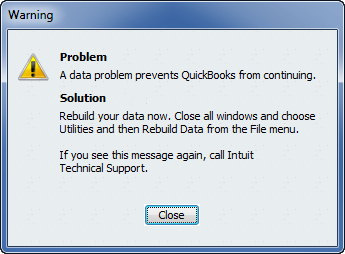 If you are NOT using QuickBooks 2011, I’m now recommending that you wait awhile longer before upgrading. My thanks to Karl Irvin for pointing this out to me, as well as several people who have left comments in other articles in this blog. In many cases, you cannot successfully verify your company file. This isn’t happening all of the time, but all of my existing test files show this problem. Try running a Verify from your File/Utilities menu. If you have damage in your company file the Verify will tell you that there is a problem. You can run the Rebuild function from File/Utilities, then examine the error log file (QBWIN.LOG) to see what errors there are. Many times the Rebuild will fix the problems. This was a file that should have been clean. I’ll be honest here – I’m not sure what this means. We often see messages in the log file that don’t indicate a real problem, so this might not mean anything. Unfortunately, this is an error that we don’t have a remedy for, so there isn’t anything that I know of that you can do to fix it. A brand new file that I created did NOT have the problem. SOMETIMES I could make the error going away by running the Rebuild three times in a row. This is an old trick that many people have recommended in the past. Some files just could not be fixed, even after running Rebuild as many as ten times in a row. I can’t say that EVERY company file in every installation will run into this problem, as I have not looked at files for all of my clients. I don’t have many direct support clients on this revision yet. I have NOT seen this problem in any 2011 R1 or R3 installations. But, again, I have not done an exhaustive test of this. I’m also starting to see a number of messages in the Intuit Community Forums pointing out the same problem. I suspect that this is introduced with R4 (can’t be certain yet). I also have a feeling that this is not indicative of a big problem. I’ve not seen any detrimental affects on data accuracy yet. It may actually just be a bug in the verify portion of the program. But I can’t be sure of that. I am a strong believer in using the QuickBooks Backup feature to make backups of your data, with the Verify option enabled. This is supposed to clean up many problems, and it clears out your transaction log. However, if you have the Verify option enabled, you cannot make a verified backup if you run into this error. To me, regardless of the importance of the error to data integrity, this is enough to make me recommend that we wait until we get a fix for the problem. Charlie – does this show up in only running a ‘back-up’ with ‘full verification’ (which is the same as the ‘Verify Data utility’) as opposed to the ‘quicker verification ‘option for local back-up(which is actually just index and table ‘validation’ as opposed to a full review of the entire data)? PS – I will post this question on the NAN discussion you started as well. Having the same problem since I updated 3 days ago. The partial validation works fineduring backup. But, the full validation will not work during backup. I am getting the same error in the log file. Bill: it only shows up with “complete” verification – “quicker” verification works. But keep in mind that you only get full error resolution with “complete” verification, and that is the only version that purges the transaction log properly. The error is in “verification”. Rob: I’ll guess that the error has been there all along in R4, I just hadn’t run into it until now (when others started commenting about it in various places). I don’t have the beta test copy of R4 any more, so I can’t say if it existed back then. I generally don’t have clients doing a full verification backup each time, just once a month, and I’ve been trying to keep clients out of the 2011 release for awhile (I like to wait until we get to January for a new year of product, usually, to let these kinds of things shake out). Charlie. Can release 4 be uninstalled? I’ve not had a problem yet but would like to avoid. Lella, you can uninstall QuickBooks entirely, reinstall from the CD to get back to R1, and then find a copy of the web patch for R3 to install that. I’m not sure, though, if that will fix the issue as I haven’t tried it. When you installed R4 it did a conversion in the file, and I don’t know if that has anything to do with this verification error. And, finding a copy of the web patch for R3 might be an issue (but you can contact me directly if that is of interest to you). Charlie – Oddly enough, this problem arose a little over a year ago in Canada with the release of QBES 2010. Unfortunately, for one of my clients, it never got resolved and they are in process of moving to a Sage product. The same issues appear within the QBWin.log files time and time again in all of the company files I have reviewed after R4 update. Unlke you, I have not been able to ‘repair’ these issues with successive ‘rebuild utility runs’ on any of the files I have attempted to do so. However, I had someone earlier today send me a QBWin.log file from their R4 data in reply to another discussion forum and their file shows no evidence of any of these issues. They have had no problems with verification or back-up at all. That disturbs me because it means that some transient factor produces the corruption rather than the same corruption being produced in each an every file from the exact same cause. Thanks for posting the problem. Intuit DOES have a fix for this problem this morning. Just got mine fixed, after waiting for an hour for level 2 support; I believe that it’s just a simple change to the qbw.ini. My tech said that this fix is covered by their “Customer Care Protection Program”, aka: this is their fault. So you do not need a maintenance contract and will not be charged. You must go directly to Level 2. Level 1 has absolutely no information about this issue. Thanks, Matt – I’m working with Intuit on this also. The solution that you refer to is working in one test case, BUT it does NOT work in ALL test cases. Still trying to pin this one down to see if an overall solution can be found that works in all cases. What if we have already moved to R4? I have run into a problem with the feature for requesting online payment for an invoice, but that’s just a minor hiccup relatively. I was waiting to post on it until I could be sure that this worked – there were some issues with some files, but it ended up being a different verification error. I have not had this error message appear when I do a backup w/ complete verification of my own .qbw R4. INT: 13220: Mon Dec 20 15:28:58 Company file C:\Users\Public\Documents\Intuit\QuickBooks\Company Files\qbm252.tmp\qbm253.tmp.qbw is open using database server:QB_HPLAPTOP_21. StructuredStorage.cpp (295) : CHECKPOINT: 13220: Mon Dec 20 15:29:34 Successful renaming backup file from U:\JSSCPA\JSSCPAPC\QB Backups\QBTempBackup.tmp Mon, Dec 20 2010 03 29 02 PM to U:\JSSCPA\JSSCPAPC\QB Backups\J Scott Stephenson, CPA (Backup Dec 20,2010 03 28 PM).QBB. FileMgr.cpp (4159) : CHECKPOINT: 13220: Mon Dec 20 15:29:40 Successfully truncated the TLG file. However, I do get this one error message at the end of the log which I am unsure if it is a problem or not (see below). Thanks Charlie – I am sure that your work with the tech quys at Intuit helped to really get the ball rolling on getting this ‘out the door’ so quickly. And Thanks to Woody at Intuit for jumping on some of the ‘blogs’ to post the fix so everyone can have their concerns relieved. The ‘edit’ to the QBW.INI file outlined in the KBA seems to have done the trick. I have tried it on ‘two’ different installs and 3 different files and it worked every time. Scott, I don’t have an answer for you on that error at this time (Bill, any comment?). I also have done a Rebuild and then a Verify on this file from the Utilities menu without any glitches or error messages. I find it strange. Any further info from QB Support why this would be a hit or miss problem with some of us? Scott, it is an internal housekeeping message. Your log file showed that this internal housekeeping wasn’t needed. Mine showed that there was some stuff to do. The details aren’t clear, and most likely I won’t get the full details. The bug is that the Verify failed on this message, even though it wasn’t an error. Turning off the message doesn’t change anything other than making Verify not flag the issue erroneously. We had the same issue and the link to the intuit website posted above has the fix that worked. I posted the errors that we were recieving from our QBWIN.LOG file. Those errors brought us to this site. Prior to doing this fix we restored to a portable file, then ran a rebuild which succeed then we ran a verify which failed. We also made sure to show all inactive items(accounts, customers, vendors). Hopefully this helps someone find this website. DHPortFile.cpp (1083) : CHECKPOINT: 3444: Wed Dec 22 16:48:51 Columns in company file C:\admin\CIOSolutionsLP-restoredfromportable.QBW NEED to be reordered, reordering NOT performed. Sorry I’m late to this thread, but I had a couple of things to add. 2) I rebooted the server and the verify data now says all is well. Anyway, hope this helps others!